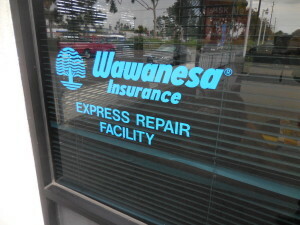 You have the right to select the repair facility of your choice. An insurer cannot require, direct, suggest or recommend that your vehicle be repaired at a specific shop unless you request a referral. A typical vehicle is damaged about once every seven years. Our goal is to provide a one-stop solution for our customer after the unfortunate experience of an auto accident. Our staff will strive to make it a smooth, quick and painless process. 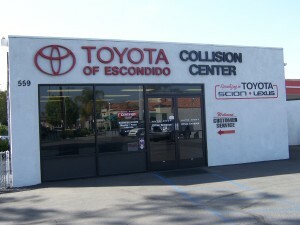 Toyota Escondido is a fully certified Toyota Collision Center. 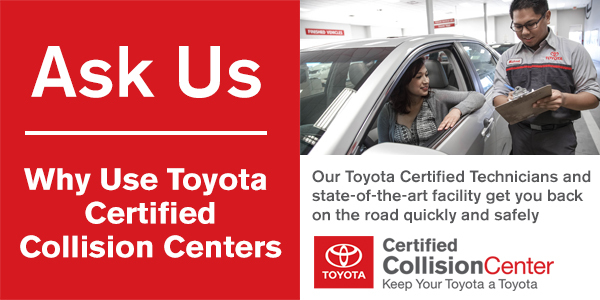 Certification by Toyota Motor Sales, USA means we have met the standards and benchmarks established in such areas from business ethics and customer satisfaction to training, equipment and environmental compliance. 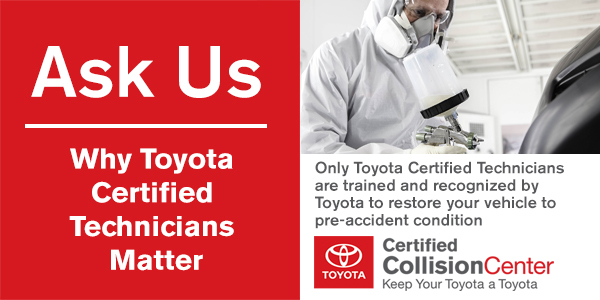 We apply these standards and benchmarks to Toyota, Scion and Lexus models, as well as ALL makes and models we repair. Our Award Winning Collision Center can handle all of your auto body, glass and repair alterations. Our staff of Certified Professionals are waiting for you.